Week 6 CFP Implications: What happens when 2 conferences are out? The CFP selection committee could have a serious problem this year, and it’s one we saw coming. That problem is the Pac-12. The Pac 12 didn’t come into the season with much clout, after going 1-8 in bowl games last year. The conference didn’t help itself with non-conference play this year– and the win over Michigan State doesn’t look so great anymore. In short, the list of contenders remaining in the Pac-12 is almost done. Maybe Colorado will run the table and save the conference. Seeing as the Buffaloes have an incredible backloaded schedule, though, I’m guessing the 5-0 start indicates a weak SOS more than anything else. And if Colorado loses a few games, it’s hard to see a one-loss Pac-12 champion getting any real respect. 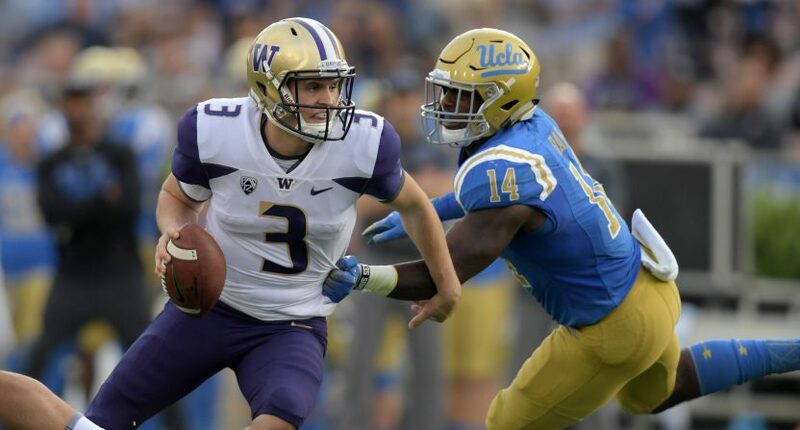 Washington’s loss to Auburn already looks worse, and the Huskies looked terrible against UCLA this week. Neither Oregon nor Washington State looks like a one-loss season is sustainable. More importantly, none of these teams have noteworthy non-conference wins to bolster a resume. At this point, it’s very possible that an 11-2 USC team (with an ugly loss to Texas) is the Pac-12’s best chance at a CFP-worthy resume. That alone isn’t a problem for the committee. In fact, one Power 5 conference not producing a Playoff-caliber team sounds like a dream come true. The problem for the committee is that there isn’t only one P5 conference in trouble. Parity in the Big 12 — plus the addition of the Conference Championship Game– means that we could have two P5 conferences with no real contenders when the season ends. Texas, Oklahoma, and West Virginia all look strong, but WVU still has to play each of Texas and Oklahoma. That’s two losses between the three already, plus a third in the CCG. It will be tough to see a one-loss champion from the Big 12. So who does this help? Obviously, Notre Dame might bail out the committee. A 12-0 (or even 11-1) Notre Dame team is looking good for the Playoff right now. But if Notre Dame falters, what’s next? The Alabama-Georgia loser seems likely, if both get to the SEC Championship Game undefeated. But don’t bet too heavily on that, because Georgia’s upcoming schedule is absolutely brutal. The Bulldogs’ next four games are @LSU, vs Florida in Jacksonville, @Kentucky, and then home against Auburn. Also, an 11-1 Penn State team would have a very strong Playoff case. After that? UCF is already in the Top 10 in both major polls, and the AAC has three ranked teams thanks to Cincinnati’s easy schedule. We’ll talk more about UCF’s chances in a week or two (assuming the Knights are still alive), but we’re only a few upsets away from the perfect storm necessary for a Group of 5 team to get a chance. Add in the fact that UCF is riding the nation’s longest winning streak and went undefeated last year, and the chance for a Playoff-buster is there. We continue another season of my CFP Eliminator. If you’re not already following, I’ll be eliminating teams throughout the year in this Twitter thread. I eliminate teams as we reach a stage where, in a year even with extreme chaos, there’s no reasonable scenario for that team to make the Playoff. Obviously, it’s theoretically possible for every team to end up about 6-6. But that’s far from reasonable, so I’m not worried about that possibility. 2007 was the most chaotic season in recent history, so my benchmark question always is, “Is there a scenario that gets this team in the Playoff? Does that scenario require significantly more chaos than 2007?” If the answer to that second question is “yes,” then the team is eliminated. This is an exciting week for the CFP Eliminator. We’re finally down to few enough teams where I’ll list the teams remaining in contention, not those already eliminated. Who’s still alive? With seven eliminations this week, there are 42 teams remaining, though some are hanging on by less than a thread. Let’s see who those 42 teams are. 42 teams not yet eliminated at this point in the season is a reasonable number, but in reality far fewer teams are alive. The reason there are so many still alive in the Big Ten and the SEC is because of how good the teams at the tops of those conferences are. Maryland, for example, would collect wins against Ohio State, Penn State, and Wisconsin if it wins out. That’s certainly a scenario that would get the Terrapins serious Playoff consideration, and likely in the bracket. There are two problems with that scenario, though. First of all, it’s just not going to happen. More importantly, it would require other Big Ten games breaking in just the right way to keep the resume as strong as possible. We’re only six weeks into the season, so there are still way too many possible scenarios for me to start judging which individual ones are likely– or too unlikely — to occur. The odds of any particular scenario happening are incredibly low. Therefore, I’m not eliminating these two-loss Big Ten and SEC teams until their best-case scenarios become impossible (or until they lose again). But don’t worry, almost all of them are done. From the Big Ten, the remaining real contenders are Ohio State, Penn State, Michigan, Wisconsin, and maybe Iowa if the Badgers drop two conference games. Similarly, the real contenders in the SEC are Alabama, Georgia, Kentucky, Florida, LSU, and Auburn. Any of those teams that win out will be in. South Carolina and Missouri, for example, are probably out even if they run the table, but I won’t eliminate them while the dream scenarios are still possible. We get Tuesday night #FunBelt action this week, and it’s a meaningful game. Penn State would like Appalachian State to win as much as possible, while every good Arkansas State win helps Alabama- not that the Tide needs it. We also get a Big 12 elimination game Thursday night, when Texas Tech faces TCU. Texas Tech wins help the AAC (and UCF), since the Red Raiders are the only team to beat Houston so far. Keep an eye on Iowa at Indiana on Saturday morning. Iowa has no real shot at the Playoff, but if the Hawkeyes can end at 10-2 they would be a great quality win for Penn State. In the afternoon, Georgia faces the first test of its gauntlet when it visits LSU in “Death Valley.” We also have a ranked Pac-12 battle (and elimination game), as Washington visits Oregon. That same window is also stacked, as Michigan State visits Penn State, UCF faces its biggest test so far when it travels to Memphis, and Texas A&M and South Carolina play a Playoff elimination game. At night, Wisconsin visits Michigan in a game with too many implications to list. It’s hard to say who will benefit more depending on who wins, but Notre Dame would certainly love to see Michigan win. West Virginia will try to keep its season perfect against Iowa State, which has shown the ability to beat very good teams these past two years. And late at night, Colorado will try to stay perfect in its first real test of the season, against USC.